Through our site you can explore Crete and organize your dream vacation in Chania. Chania Rentals is a Chania based company; we live here, we know the people, the culture and the different areas of Crete. We hand-select every villa, scrutinising each one to ensure we are offering the best quality accommodation at an affordable price. We also make it our business to know the owners of each individual villa that is listed on our web site. We spent a lovely relaxing week at this wonderful villa,. More than met our expectations.warm welcome from Stella and lovely homemade cake later in week. Fresh produce from gardener, villa very clean and Sophia the cleaner very friendly. It was an absolutely great stay at Artemis Villa. Petros and Manos supported us, two families, very nicely including brilliant surprices. Definitely we will come back. Very pleasant house was situated in a nice town, the owners are charming and of sound advice, we thank them for the welcome(reception). 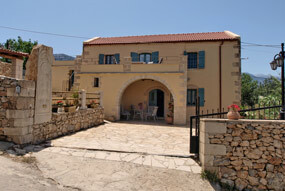 The villa is ideally situated to visit the West of the Crete. Thank you very much for the wonderful stay! The house, the pool and the view are excellent! Everything you need is provided for, the beds are good, there are enough towels and linen, the kitchen is well equipped, and the aircon works perfect! We highly reccomment this villa!